A newly edited, single-volume commemorative edition of 'The Path to Power' and 'The Downing Street Years'; this is Margaret Thatcher in her own words. READ BY MARGARET THATCHER. 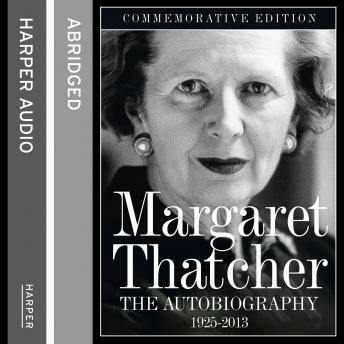 Combining her memoirs 'The Path to Power' and 'The Downing Street Years', this definitive account of Margaret Thatcher's life is published as a one volume commemorative edition for the first time. Margaret Thatcher was the towering figure of late-twentieth-century British politics. Now following her death in 2013, this is the story of her remarkable life, in her own words. Beginning with her upbringing in Grantham, she goes on to describe her entry into Parliament. Rising through the ranks of this man's world, she led the Conservative Party to victory in 1979, becoming Britain's first woman prime minister. Offering a riveting first-hand account of the critical moments of her premiership - the Falklands War, the miners' strike, the Brighton bomb and her unprecedented three election victories, the book reaches a gripping climax with an hour-by-hour description of her dramatic final days in 10 Downing Street. Margaret Thatcher's frank and compelling autobiography stands as a powerful testament to her influential legacy.